The Hornet’s Nest: Boots on the ground. The cynic inside me has grudgingly accepted the fool notion of young men and women enlisting to kill in the name of peace, but why would a civilian war correspondent risk life and limb to send home pictorial confirmation of government-sanctioned brutality? 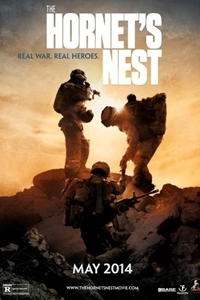 David Salzberg and Christian Tureaud’s harrowing documentary The Hornet’s Nest answers the question. The notion of a photographer’s moral obligation to their subject first hit my radar at age 13. The front page of the evening edition featured a photograph of South Vietnam’s chief of National Police, Nguyễn Ngọc Loan, cavalierly pumping a bullet through the head of handcuffed prisoner Nguyễn Văn Lém while AP photog Eddie Adams snapped away. Intervention may have resulted in a bullet for himself, but the least Adams could have done was dip his lens out of respect. The picture earned him the 1969 Pulitzer Prize for Spot News Photography and became the most iconic image of its era. Mike Boettcher’s 34 years of dedication to his job as network correspondent helped earn him enough Absentee Father of the Year trophies to bridge three mantelpieces. In the tradition of John Ford, Mike’s grown son, Carlos — born with a confidence he “had not yet earned” — needed to know why his father chose career over family. Inexperienced combat journalist that he was, Carlos was determined to join the old man’s next overseas embedment whether dad liked it or not. The decorated journalist never once figured that, in his case, “take your son to work day” would give rise to a year in war-torn Afghanistan. Some of the Boettchers’ talking-head testimonials, with their slick veneer of a polished news broadcast, tend to heighten drama at the risk of straining credibility. A projectile is heard and not seen. In an instant, both Carlos and his camera hit the deck. Fortunately, nothing happened, but the filmmakers insist on playing the tragedy card by hinting for a moment that Mike’s gamble could have cost him a son. A dissolve to a commercial break was definitely in order. Not since Gunner Palace has a war documentary brought the viewer this close to a world where it’s strange for a few hours to pass without a bullet whizzing by or an IED going off. In spite of its gung-ho, good ol’ boy score, The Hornet’s Nest is by no means a recruitment film or video-game app. With unprecedented real footage to guide us, the filmmakers propel their audience into hostile territory for 93 minutes. Not unlike our onscreen counterparts, we never know where the next shot will come from or whom it might hit. Political finger-pointing is never up for consideration. This one’s about camaraderie and what it takes for soldiers to live through another dawn. “Once there,” the elder Boettcher recollects, “they no longer fight a war on terror. They fight for their buddies.” It’s Mike’s job to “run toward danger,” and in doing so, he’s been entrusted to care for and maintain the soldiers’ stories. Why not give them a listen this weekend? And be sure to sit through the closing credits for a few revivifying perks.